View our range of pneumatic cylinder mounting accessories designed for either the cap-end or rod-end of your device. Cap-end mounting accessories are designed in accordance with ISO 15552, 21287, or 6432 to allow for interchangeability between manufacturers. The cap-end of ISO 21287 and ISO 15552 have the same dimensions for cylinder diameters between 32 and 100 mm. A cap-end mounting allows you to fix your pneumatic cylinder to a mounting surface by either fixing it in place (flange or foot mount) or allowing it to pivot in place with a clevis. 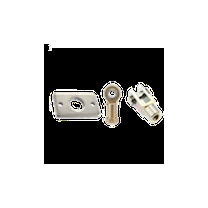 The most popular rod-end mounting accessories are clevis rod-ends, spherical eyes and floating joints. They can be used with any pneumatic cylinder size, as long as the rod-end thread size matches for proper connection. Floating joints are a good solution if there are any misalignment issues or concerns. Pins are also available to connect any clevis and/or spherical eye together to allow for pivot movement. If you have any questions regarding pneumatic cylinder mounting accessories, please read our technical article or contact us.